World Water Day is held each year on March 22?as a means of focusing attention on the importance of freshwater and advocating for the sustainable management of freshwater resources. Water security, whether it is the challenge of too little water over long periods of time, or too much water all at once, is one of the most tangible and fastest-growing social, political and economic challenges faced today. ?It is also a fast-unfolding environmental crisis. In every sector, the demand for water is expected to increase. The World Economic Forum?s Global Risks 2014?Report takes a ten-year outlook, assessing the 31 risks that are global in nature and have the potential to cause significant negative impact across entire countries and industries if they take place. Water ranks as the third highest concern on this list. Water is the link between food, energy, climate, economic growth and human security. Its importance to sustainable agriculture is critical. Without a doubt water and agriculture are inextricably linked. The need for greater focus on sustainable agriculture policies and practices are critical.? Agriculture is a major user of both ground and surface water for irrigation?accounting for about 70 percent of water withdrawal worldwide. Crucially, water cannot be substituted, and therefore this stress on the world?s water will affect food and energy systems around the world. It is predicted that within the next 15 to 20 years, the worsening water security situation risks triggering a global food crisis. In the United States, agriculture accounts for around 80 percent of consumptive water use, and in California, the nation?s breadbasket, over 90 percent of water use is for agricultural purposes. California is also experiencing the worst drought in over 100 years ago? nearly 95 percent of the state remains in a drought. The state supplies nearly half the country’s fruits, nuts, and vegetables, and is a major producer of almonds, artichokes, wine grapes, table grapes, olives among other agricultural products, many of which are water-intensive in their production. 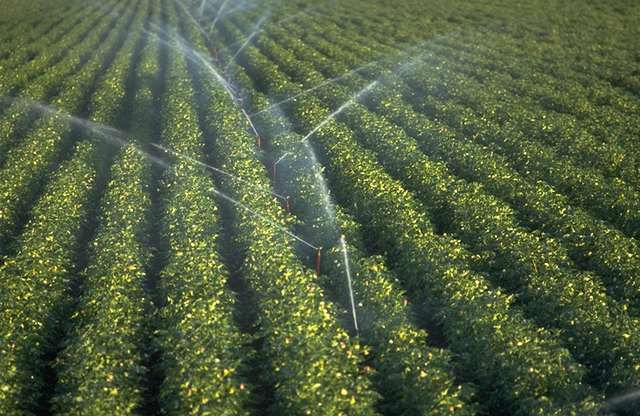 In the face of this global threat, farmers worldwide are using innovative practices, such as drip irrigation, to utilize water more efficiently and in lesser quantities.? Drip irrigation saves both water and fertilizer inputs by allowing water to drip slowly through a network of tubing to the roots of plants. Another example is re-use of waste water. In California agricultural waste water from irrigating crops is being reclaimed and treated for re-use, also benefiting the environment by avoiding discharge of chemicals into surface water and helping retain soil nutrients, preventing them from being washed away with the run-off water.